It’s no secret that I’ve become quite obsessive about my adopted island home of Taiwan so it’s always a joy to discover authors who hail from these shores. First it was Charles Yu whose How To Live Safely In A Science Fictional Universe has secured a permanent place on my favourite books list. Then along came Wesley Chu, another American author of Taiwanese origin, whose The Lives Of Tao was a fantastically original and enjoyable piece of sci-fi mayhem. Such was its success that he’s back already with a sequel (and another already in the pipeline). Not only that but this time he brings the action to Taiwan! The Deaths Of Tao picks up a little down the line from its predecessor and the civil war is still raging between the Prophus and Genjix, rival factions of an alien species, the Quasing, who crash landed on Earth millions of years ago. Unable to survive in our atmosphere, these incorporeal and extraordinarily long-lived visitors inhabited the bodies of earthy organisms, hitching a ride until the rise of a conscious entity (us, naturally) with which they could communicate and whom they could also manipulate, feeding them information and ideas with an eventual aim of developing the technology which could return them home. Idealogical differences over the Quasing’s treatment of their hosts sparked violent disagreement which soon escalated into full-blown war. Our protagonist Roen found himself an unwitting participant when the Prophus agent Tao, on the sudden death of his previous vessel, was forced to inhabit his body and induct him into the front ranks of this invisible conflict. 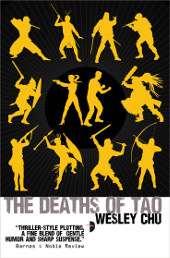 The Lives Of Tao followed Roen’s training and struggle to accept this new reality with which he was confronted. By the time we pick up the story in Deaths both he and his Prophus friend have gone rogue, abandoning the Prophus council and following their own suspicions about recent Genjix activity. His estranged wife Jill and her Prophus remained where they were, although Roen keeps an eye out for their safety from his hidden missile silo. Yeah, this book is far from serious. Before long Roen and Tao’s investigations bear fruit and the Prohus are forced to accept what is happening. The Genjix are attempting to recreate conditions suitable for their own unaided existence on this planet. Unfortunately this requires a significant increase in temperature and an environment entirely hostile to human life – global warming anyone? Following the trail requires Roen to rejoin the Prophus and infiltrate Genjix operation in Taiwan. Meanwhile Jill has her hands full in America as the Prophus influence in government wanes and it seems the Genjix are attempting to seize control of the entire country. On the Genjix front, one of their most venerated agents has acquired a new vessel, Enzo, trained from birth to be the perfect host – powerful, smart and deadly. The Deaths Of Tao is really just more of the same and it’s very welcome for that. In between fleshing out the history of the alien inhabitation of our planet and the schism which led to the current situation, Chu weaves another massively entertaining tale, throwing together sci-fi, political intrigue and spy thriller. Although the tone is in some places significantly darker than the first installment it never loses its sense of humour. This is a book which is very aware of what it is, never taking itself too seriously or forgetting what it’s supposed to be. One of the strong points is the cast of characters. Flawed but likeable Roen, conflicted Jill, and their respective agents work together remarkably well and form an anchor for the rest of the novel. The supporting roles are equally well fleshed out and Chu managed to create a hell of a villain in Enzo – ruthless, willful and just generally detestable. He manages to toe the line between supervillain and overblown parody perfectly, always right at the limit of evil without ever straying into comedy territory. In short, The Deaths Of Tao is extremely good fun. Nothing too heavy, just a perfectly balanced blending of sci-fi, comedy and action which should perfectly while away a lazy Sunday afternoon. 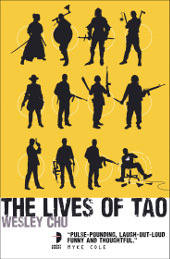 If you haven’t read The Lives Of Tao already then do it. You won’t regret it, I promise. After that just try and stop yourself picking up this ridiculously fun sequel.